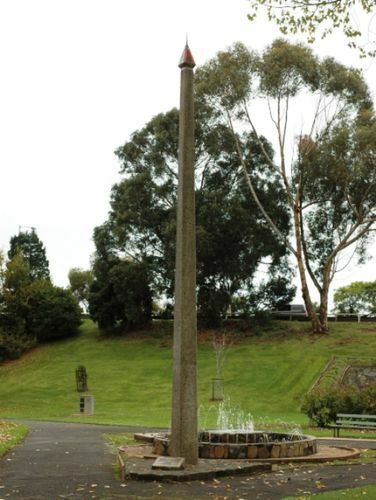 An obelisk unveiled on the 150th anniversary commemorates the site where architect and surveyor Henry Hellyer camped in May 1827 on his visit to Emu Bay, prior to the establishment five months later on October 9, 1827 of a township by the Van Diemen`s Land Company. Henry Hellyer (1790-1832) was an English surveyor and architect who was one of the first explorers to visit the rugged interior of the north west of Tasmania, Australia and made the most comprehensive maps of the area up to that time. Henry Hellyer explored most of North Western Tasmania for his employer, the Van Diemen's Land Company (VDL Co), and wrote extensive journals and reports which are held in various archives. His best known journey was in 1827, when with Richard Frederick and Isaac Cutts, he travelled from Circular Head to St Valentines Peak and back, in February 1827. Hellyer committed suicide in 1832. Henry Hellyer, Van Diemen`s Land Company architect and chief surveyor camped near this spot on May 18, 1827. Five months later, on October 9, 1827 the Company`s Chief agent Edward Curr decided to establish the township later called Burnie.